Teegan Van Gunst is an unquestioned leader of the volleyball team. A senior in Mechanical Engineering with twin sister Annika, she leads the team in kills. Technique: How did it feel to be selected as a candidate for the 2016 Senior CLASS award, [which is presented to senior student-athletes nationwide]? Van Gunst: It was kind of a surprise, but it’s definitely an honor that I didn’t think much about. It’s really cool to be included in that group of people to represent what we do here at Georgia Tech. Technique: How difficult is it to balance rigorous academics while simultaneously playing volleyball at a high level? Van Gunst: It can be difficult at times … a lot of late nights, especially around midterms, but it’s just a grind that we love honestly. We know it’s hard, but … I don’t think we ever get used to it. Technique: You attended the United States National Team’s open practice. What was that experience like? 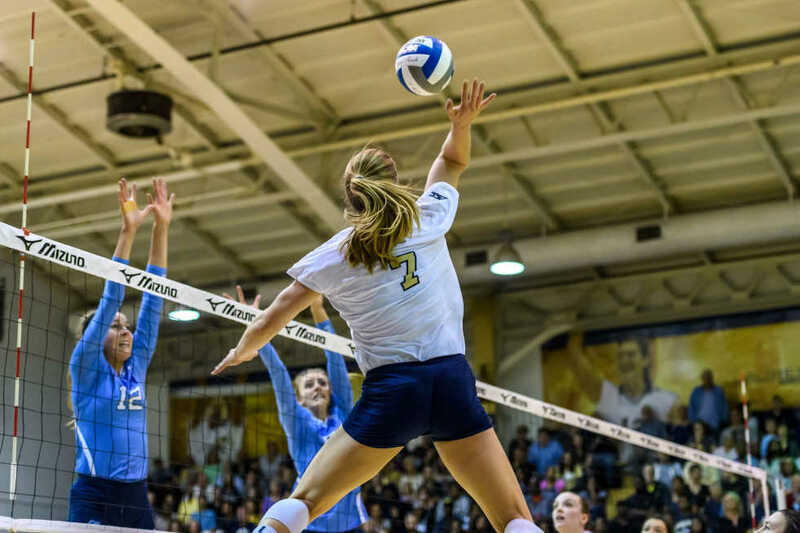 Van Gunst: It was definitely cool, especially hearing from coach [Karch] Kiraly, who is pretty much a legend of both the beach and indoor, so definitely cool being in the gym with that kind of prestige. Technique: How long have you been playing volleyball, and what made you start playing? Van Gunst: I started playing in the seventh grade … and pretty much because my PE teachers saw that we — me and my twin sister, [Annika,] — were tall, and they were like, “You should try out for the volleyball team,” and we were like, “I don’t even know what a volleyball is, but sure.” We had no clue what volleyball was going into it, but we love sports. We were soccer before that. … We’ve been playing since then. Technique: What is it like to compete alongside your twin sister, Annika? Van Gunst: Really cool. I don’t know too much about not playing with her because we’ve been always playing together. It’s definitely cool to have someone on the court that you know so well and is with you all the time. Technique: Are there any schools you particularly look forward to competing against in the next few weeks? Van Gunst: I’m looking forward to the rematch with Pitt this Sunday. We played them earlier in the season — I think it was our first ACC match of the season at Pitt — and we didn’t play as well as we could have, and they played very well. I’m looking forward to that rematch … getting even with them. … We haven’t played Florida State yet, and I’m also looking forward to UNC because we lost to them the first time. I would say that every game from here on out is a huge game for us, but I would say those three are the highlights. Technique: What are your long-term career plans? What’s next for you after you stop playing volleyball? Van Gunst: Geez, hopefully that won’t be till another few more years because I want to continue playing. … Outside of school, I want to … play professionally. Those leagues are typically in Europe or South America. There’s not a U.S., league, so I’d go overseas for that. Either that, or I’d stay [at Tech] for a fifth year and start my masters’ and play beach [volleyball] and transition to the beach game. Technique: Last year, you beat Monique Mead’s single season number of kills with 471 kills, and you averaged 3.92 kills per set. Right now, you’re at 369 kills, and you’re averaging 4.24 kills per set. Are you focused on surpassing your stats from last season, or do you have another goal in mind? Van Gunst: Obviously, I want to do better than I did last season. … You always want to be getting better and growing in your game. Monique was an awesome player here — a four-year All-American — so I guess being in the same conversation with her and upping the numbers that she was at is definitely awesome, but … we want to win. We haven’t been to the NCAA tournament for a good number of years, and that’s honestly my number one goal. Technique: How do you feel about the odds of reaching the NCAA tournament? Van Gunst: I think our odds are good if we keep playing the way we’ve been playing. We’re excited, but we also are staying hungry because we still have eight regular season games left. That’s a lot of room for things to change. … [We’re] just focusing on one game at a time. If we continue on the path that we’re on and keep working hard in the gym and playing with the confidence that we’ve been playing with … especially over the last few weeks, … we’re looking to upset some people once the tournament starts. Technique: What would you tell Tech fans about the rest of the volleyball season? Van Gunst: Everyone should come out to our games. This weekend and two weekends from now. … Senior night is on [Nov. 20] — Notre Dame and Louisville.